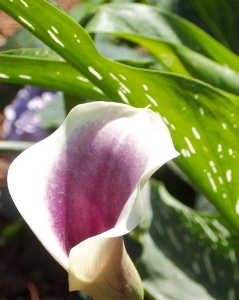 My mother taught me to Love Calla Lilies – Johntheplantman's stories, musings, and gardening. I love calla lilies. The bulbs sit dormant in the ground all winter and then start sending up spearhead leaves in the late spring. Callas seem to know somehow when the time is just right for them to sprout up and send their lush foliage out into the world. They grow and grow until the time is just right to send up a lovely flower. Callas are most prolific, too. Their bulbs make offshoots that may be dug and divided. If some of the flowers are allowed to mature, clumps of seedlings will sprout up in the late summer, die back for the winter, and then show back up the following spring. I got my start with these wonderful plants one fall when Mom handed me a shovel and led me out into her flower bed. She showed me just where she wanted me to dig. I put the shovel in the ground as instructed and pulled out a clump of dirt that held a number of bulbs. I shook the dirt from the bulbs and looked up at her for further instructions. “Do you know how to divide bulbs?” She asked. “Of course I know how to divide bulbs.” I giggled and started. We laughed about that and made three piles. I replanted Mom’s bulbs, put sister’s bulbs in a bag for later delivery, and put my collection in the back of my truck to take home and plant for myself. That was years ago. I was never one to put flowers in the house, either. I just loved to watch them grow, and being a grower, I liked to study how any plant reproduces. Over the years, I had learned to root cuttings, make divisions, and grow plants from seed. I enjoy watching the plants grow and studying the ways in which they work to maintain their particular species. When the question is asked as to whether the tomato is a fruit or a vegetable, I can always answer that it is a fruit because a tomato is really a ripe ovary that is made up of seeds with a protective and nourishing cover. The reason that a lot of fruits are so nourishing for people is because they contain the elements that are necessary for growth and development of their potential progeny. There are, of course, a lot of fruits that are not good to eat, but that comes from methods developed by the plants to protect their seeds. I watched the calla lilies for a few years, wondering at the shape of the flower which looked as if it had been formed from a stiff, smooth cloth that was cut and wrapped around into an open chalice. I watched as the flower was fertilized by the bees and as it then lost its color. I watched the colorless bloom as it stood straight up for a week or two while seed pods formed inside. 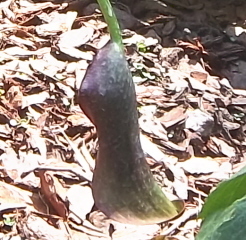 Next, the calla lily flower did something different. It took me a couple of seasons to realize what was going on, but here’s what I noticed. The flower stem bent over slowly and gracefully during the space of a few days, ending up with the bloom upside down on the ground. I watched this spent bloom for days and weeks until I realized that the shape of the flower was similar to an Indian teepee and that it was protecting the seeds from the elements as they germinated and grew. 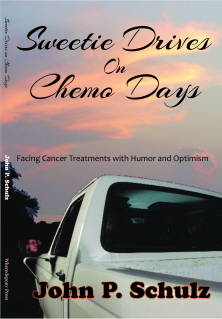 After a while, the tent went away and a clump of small plants appeared just where the tent had stood. That’s when I really fell in love with the calla. I had to admire a mother that went to so much trouble to care for her fragile young. 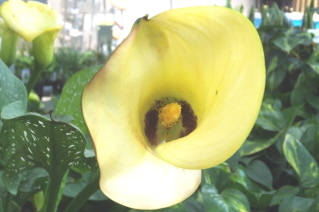 You will find calla lily bulbs in nurseries or by mail order. You can get a very nice catalogue from K. van Bourgondien &Sons. I buy a lot of bulbs from them. You will also find blooming pots of calla lilies in nurseries or through a good florist. You can enjoy the blooms and then install the plants in your garden where they will thrive for years. John, you know how I love Calla Lilies! My first colored one came from one I bought at a feed store. It was marked “yelow” and that was good enough for me. That same plant has reproduced in several places in my yard and is my favorite. The petals are outlined in bronze and it is soooo beautiful! I’m so glad you share my enthusiasm! I wrote that with you in mind. You are my wonderful mom. I love calla lillies too. I also admire the relationship you have with your mother. :) Tell her “hello” for me. Think I had them mixed up in my mind with canna lillies.